Dawn usually finds me curled up on the couch with my first cup of coffee. I like to get up early but rarely step outside until after the sun is up so it took me a few days to find a picture to meet A Word in Your Ear’s latest challenge – Dawn. New Year’s Day is different though and while most of my family is sound asleep I get up as early as I can and take a walk to begin the new year with a fresh start. 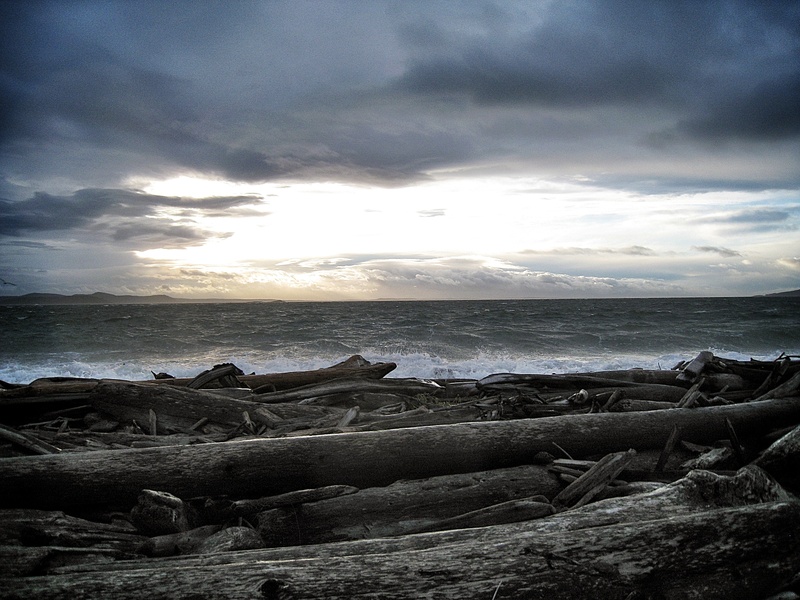 This picture was from my January 1st, 2010 walk during a wind storm on Decatur Island. The clouds were dark and heavy when I began but as the wind blew an opening for the sun I shielded my camera from the salt spray and quickly snapped this photo. If you would like to see more images of Dawn around the world please visit A Word in Your Ear and the Word A Week Challenge – Dawn. I love your idea of getting up early on New Year’s Day to welcome in the new day. I’ve never thought to do that. It’s always about staying up until midnight the night before. Next year, I may have to go to bed earlier and greet the dawn instead. Thanks for the idea! Thanks! I usually stay up until midnight too but love my walks so I get up early and then try to take a nap later in the day. 🙂 I’m glad you like the idea! I’m glad you liked this one! Thanks for the reblog and the opportunity to share my photo with your readers. Ah, yes, and the wind! It looks almost surreal. I love it. Thank you. 🙂 It was a beautiful moment in a very stormy day. I’m glad you it! Decatur is one of San Juan Islands off the northwest coast of Washington state. It is a beautiful area and one of my favorite vacation spots. That’s what I thought. My parents have a cabin on Saturna Island — one of the gulf islands just south of the San Juans.. from the peak of the island we can see the San Juans all clustered together. Beautiful! We’ll have to head there for a visit. You will love it and feel right at home at the same time. 🙂 I want to plan a trip to the Gulf Islands too. My parents have taken their boat through them and had a great time. Beautiful sight to start a new year! Thanks for the tip, I agree it is a little rough when seen at full resolution. 🙂 There was so much salt spray in the air I had to be fast and now it does need some work. Great, I appreciate the help! You are welcome to play around with it if you want to. 🙂 I don’t have Lightroom or Photoshop right now but they are on my “to purchase” list so it might take me a little while to try on my own. I am just starting to learn and am open to all feedback. I’d be happy to give it a try, why not 🙂 I’ll send you the basics of what I did as well. Hey, thanks so much! I can’t wait to see your results and learn how to start editing some of my photos! One of my brothers and I took a walk on a South Carolina beach just after dawn this morning, and although I didn’t snap any pictures as beautiful as this one, I did manage to capture some early morning images. Has a slightly surreal feel to it. Very atmospheric. Thank you for visiting today, I’m glad you liked this one! I absolutely love your image. Excellent work, and I’d like to know which camera you’re using, and what lens on this shot? Wonderful to find you, here in the great NW! Thank you for letting me know, because usually the camera is key to the outcome of the image. 🙂 I hope you will check out my photography at http://fikaafterfifty.wordpress.com/ although I don’t have a lot of pictures of the Seattle area posted yet. Thanks – and you’re welcome! How fun, thanks for letting me know!